Stephanie Shepard graduated in 2016 with a Master of Public Policy. At OSU, she worked with Hilary on the community reactions to extreme weather project, completing her essay on the 2013 floods in Boulder County, Colorado. 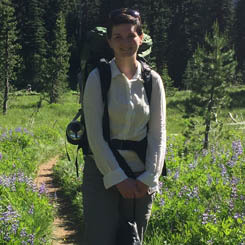 She also interned with Sustainable Northwest in Portland, Oregon, researching a collaborative forestry network. Stephanie grew up in West Virginia and earned a Bachelor’s degree in English from West Virginia University. After graduation she spent a year in AmeriCorps, working with New Orleans Area Habitat for Humanity before returning home to work with non-profits serving low-income people. She became interested in learning about environmental policy when she noticed that the Appalachian region has a high rate of poverty despite being rich in natural resources. Stephanie enjoys hiking, gardening, nature photography, and finding a great swimming hole to spend a Saturday afternoon in the summer. After OSU, she completed a Hatfield Resident Fellowship in Florence, Oregon.